I’m going to be honest: there are so many website builders out there these days that it takes an awful lot to impress me. You might call me cynical, but it’s the result of an Internet populated with Bloggers, with Intuits, with GoDaddies, with Yahoo!s: if I’m going to be convinced by a site like Yola that I should build my site with them, I need to be wowed. So I was actually a little surprised when I checked out Yola and found it to be quite the audacious little website builder. Their portfolio of Yola-created sites was better than most cookie-cutter website builders. Their shopping cart abilities instantly makes them a contender for any small business coming Yola’s way. Their drag-and-drop interface keeps things simple, which is nice if you’ve never even heard of HTML, let alone understand it. What does this all mean for you? Well, it depends on what kind of website you’re looking to build. But the truth is that Yola has a surprising amount of versatility with an attractive price range – depending on what you need, as we’ll detail later – and is simple enough to use that even your 15-year-old should be able to figure it out. Heck, even Internet newbies who can qualify for senior citizen discounts shouldn’t be intimidated at all. You might be convinced too, after a quick gander at this humble Yola review. So without any further ado, let’s see what has this reviewer so giddy. Usually I like to tackle the price issue last in my reviews of sites here at Clickfire.com, but for the Yola review I’m going to change up the formula a bit. Let’s talk about price right now. Yeah, I said it. I bring it up because the price is one of the things I can’t quite figure out about Yola. It essentially works in three tiers: free, less free, and way less free. In other words: free for the Yola Free package, $49.95 a year for Silver, and then $349 plus $49.95 every year after that for Yola Premier. Confused? Now you see where I’m coming from. The good news is that much of the meat of Yola actually comes with Yola Free. The website creation tools are all available there, including analytics, customer support, and the click-and-drag site builder. You’ll also be able to create 5 sites from your Yola Free account, which is a lot more than you’ll see from other providers. So with all of this good stuff free, why does Yola really have more advanced pricing tiers? Do they really expect me to pay over $300 for their “professional design help”? I’m sure it’s nice and everything, but if I’m building a site on my own, I’m expecting to pay zero and expecting to be happy about it. I’m not very motivated to pay $49, let alone $349. But since all of the important features come with Yola Free, there’s really no reason to fret about it. The price is right, and this means you can really build “websites for nothing,” as the title of this humble Yola Review advertised. So if you’re paying nothing, you can’t expect much, right? With Yola, you’re wrong. Yola really delivers the goods here. I love the drag-and-drop editing system, and I love how easy it is for you to design a site that isn’t really anything close to the cookie-cutter templates we’re so used to from free website building sites. Yola definitely overdelivers on its free pricing features, which may be why it seems to be underdelivering elsewhere. An editable background is a nice feature that allows your site to pop free of that cookie cutter. How many times have you created a site only to hate the fact that the background was only black or only blue, or only…well, you get the point. If you can create a nice-looking site like this using Yola Free, then you’re good to go. 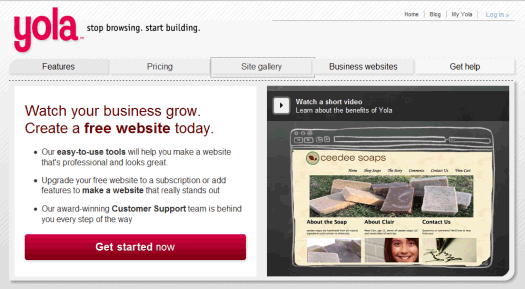 (You can find more examples of Yola sites in their site gallery). There’s a limit on the files you can upload to your site – a maximum of 15 megabytes isn’t so great – but that seems to be one of the few weaknesses of the Yola free package. To sell your wares on your Yola site, just use PayPal’s shopping cart, which you should be able to integrate easily into your Yola site. This does appear to be part of the Yola free package. Admittedly, the Yola designs and templates aren’t spectacular, but they’re much more serviceable compared to the other free website builders out there. If you definitely want to go with a free website builder, then Yola should be at the top of your list. Other features? You can buy and host your domain names through Yola, which costs extra but is a way of simplifying things if that’s what you want out of your website builder. I’d recommend keeping your own hosting arrangement with a reliable and cheap hosting company and integrating it with a website builder like Yola – but that’s only if your heart is set on using a website builder in the first place. What to conclude about Yola? It’s definitely on my list of “impressive sites to suggest to friends should they ever ask about free website builders.” And no, if you’re wondering, I don’t actually have that list hanging around somewhere. Even so, it’s hard to argue with the quality of Yola’s templates, the ease of the design functionalities, and the general value you get for registering for free. If you want to use Yola properly, try to avoid the payments and simply work things out yourselves. Treat Yola like a free site and use all of its free features to the fullest – when you do that, you’ll be getting quite a bargain. It’s also simple enough to introduce to the less computer-savvy among us, so if you want to show Yola to your friend, you can definitely do a lot worse. I was reviewing Yola a few days ago, and I must say it has a very neat and simple CMS. A great candidate for those who have no prior coding experience.